SPEED Braces have revolutionized orthodontics by eliminating the need for the elastics that traditional braces require to straighten teeth. Instead, SPEED Braces use an energy-storing component called a ‘Spring Clip’ to straighten teeth. The SPEED Spring Clip works like a computer chip inside your braces. The Spring Clip is ‘programmed’ by your orthodontist when SPEED Braces are placed on your teeth. The Spring Clip, made of a ‘Super-Elastic’ space age material, then follows the programmed instructions by applying a light continuous force to gently move teeth to their correct position. 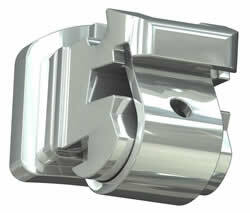 Only SPEED Braces contain a ‘Super-Elastic’ Spring Clip. The result is greater comfort, and potentially fewer appointments and more ‘SPEEDy’ treatment. SPEED Braces are small; typically 1/3 smaller than traditional braces, and they look great! SPEED’s small footprint results in less food trapping, so good oral hygiene is easier to maintain throughout your treatment. upper front teeth than on lower teeth. Lingual braces are hidden behind the teeth and are therefore “invisible” when you smile. 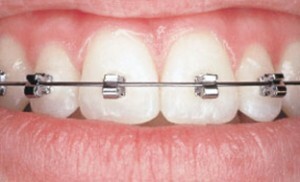 We currently use lingual braces on crowded lower teeth.